When you are trading as with many other traders, you would want to maximize your profit. For every dollar that you invest you want gain as much as possible right? In order to do this you will need a broker that gives you leverage or provide you tools such as options or CFDs. 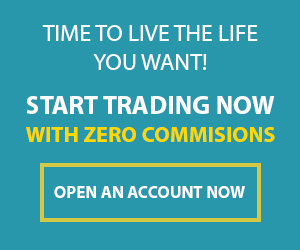 Many brokers like Plus500, Instaforex and Markets.com gives you the opportunity to maximize your profit on every pound you invest. These brokers mentioned gives you the ability to make a trading in oil. Keep in mind that not all brokers gives you the ability to make a trade in oil. So now let’s go to oil. When you look at the oil chart (above), the first thing you need to do is to determine the current trend of oil. There are three kinds of trends. Up trend is also often called Bullish trend. In a Up trend Oil price goes higher and higher after every small downgrade in prize. 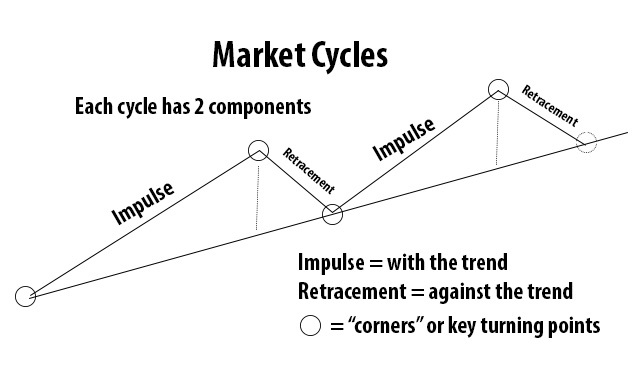 You can recognise a up trend by the following: each cycles their top goes higher then the previous cycle. And the bottom of each cycle goes up as well. In this situation each prize cycle doesn’t show much of a price difference each cycle. 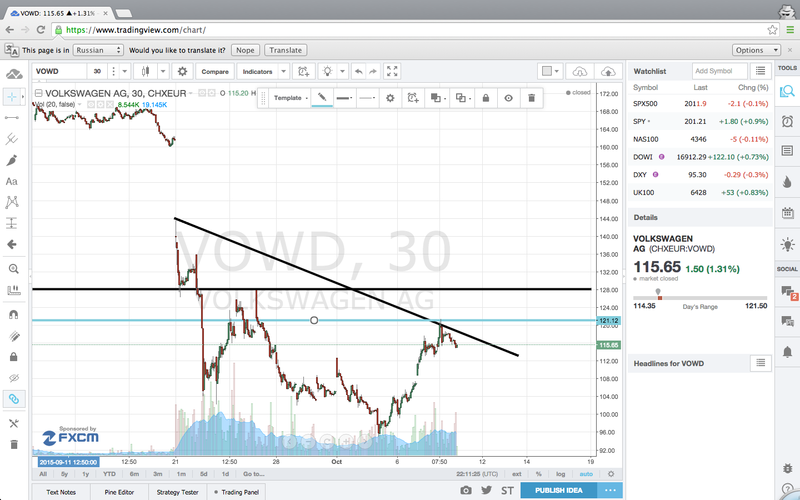 Therefore its better not trade in this situation because the risk reward ratio is too small. In a down trend the price cycle of for example oil is going lower after each cycle. For example oil price today is 48 usd. Yesterday it was 52 usd and the day before yesterday oil price was 56 usd. The down trend is often called as bearish trend. The next step in making money with trading oil is recognise a entry point to the trade. For most people this is difficult because they don’t determine the market condition first. Once you have recognise the market trend. Its very easy to determine the price point for you to invest in the trade. All you need to do is buy at the point when you think the next cycle will start. Often the best point to buy is the ”corners” under normal market condition. In this final step you are going to determine what your exit point (selling pirce) is and decide if it is worth to make a trade. So how to determine your exit point of your trade? Just take a look at the market cycles. For me the best way to exit a trade is by taking my profits before the price reach to a next key turning point( corners). Because if I wait till after the “corner” point then there is a good chance that I will lose my profit because the price trend might change. There is a big chance that it goes into the opposite direction of what I wanted. Therefore it is better take my profit before the price at that key turning point price level. When you have determine what you entry point ( investing price point level) and what your exit point is. That way you can see what your potential profit is. If the profit potential is too small then don’t trade. And if the potential profit is big then start a trade. Al right guys hope this have helped you a better understanding in trading. If there are any question please post it in the comment section. I will get too it as soon as possible. Have a series of successful trades ladies and gentlemen. CFDs dividends. Did you know that you could get dividends that are paid on shares with CFDs? It is really simple. 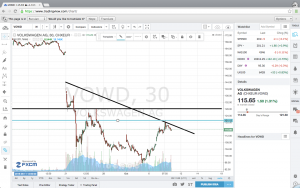 In this article you will get to know when to invest in cfd’s to get the dividends. And you will find out how the dividends dates will influences your CFDs dividends position. If you don’t what CFDs are then please read this: CFDs. CFDs dividends: How does it work? Before we are going into CFDs dividends let’s check out how the dividends payments work on shares. When you own shares there are three important dates that you must know and remember for the dividend pay out. The first date is called ex-dividend date. If you bought shares before the ex-dividend date then you are entitled to get the dividend. However if you buy shares on the ex-dividend date or after then you are not entitled to receive the dividend. The second date is called the record date. This date record last three days right after the ex-dividend date. In this period the investor must held their stock position in order to get the dividend. The reason for this is that it takes three days to settle the purchase of shares. The third date is the payment date. Its a fixed date where the company will pay the dividend to their shareholders. Usually this date takes after 2-3 weeks after the record date. So how does the dividend payments works when you are having cfds dividends on these shares? Let’s say you are trading in these CFDs dividends of a certain share. Now you probably know that there are various charges and credits when you have open a cfd position. The dividend adjustments is one of these credits. Typically, the actual dividend payment made by a company is usually made a few weeks after the ex-dividend date. For instance, XYZ Company might go ex-dividend on the 3rd August but pays the dividend money on the 3th of September, however when owning a CFD dividends position for this period you’ll be credited the dividend on the following business day. Great isn’t? Well it is just one of the advantages of trading in CFDs dividends shares. When you hold a long position in CFDs dividends shares, and held it the day before the ex dividend date, then you become entitled to receive a payment equivalent to the amount of the dividend. Remember that you must be in the position before the ex-dividend date to receive the dividend. For instance if the share you controlled through a CFD went ex-dividend on Wednesday, then you will need to have bought these CFDs dividends shares at least on Tuesday to earn the dividend credit. If you are shorting the CFDs dividends shares then the situation will be different as you now owe the equivalent of the dividend, and it will be debited to your account. Holding a short position is good in one way, because you get paid interest instead of paying interest on the margin as you do when you are long, but this is one place where you have an immediate apparent loss.Thus, if you are short selling a share or other securities (i.e. standing to gain from the position if the share price falls in value) and you are short prior to the ex-dividend date, then you will owe the dividend. However the situation is not so clear in reality as it is described above. The reason for this is that you must also consider is that the share price will change on the ex dividend date to reflect the amount of the dividend, more or less (although some traders make use of a dividend trading strategy to exploit market inefficiencies). On the ex dividend date you can expect the value of the shares to drop by nearly as much as the amount of the dividend, which maintains a level equity for the conventional shareholder.What this means in is that your long CFDs dividends position might take a hit, even while you are receiving funds for the dividend amount. The short position will make a profit which offsets the dividend debit to your account. It’s has been a while that we have heard of the Bitcoin. Since its all high-ranking peek of $1124.76, the Bitcoin value have mainly dropped down in price. However since the begin of June the Bitcoin value have been increased by 10% so far. In this article we are going to look to see if it is time to trade or invest in Bitcoins again. There is a good chance that the Bitcoin Value can go up nicely this year. And here is why. More and more Bitcoin related start up companies are coming up and many investors are funding them. One these investors is Goldman Sachs. Goldman Sachs invested this year $50 million in a Bitcoin related start up company. Which is surprising to me. I thought all banks were against bitcoins. Goldman Sachs is not the only bank that has invested in a bitcoin company. Big banks all over the world are considering investing in bitcoin companies. How is the Bitcoin performing on the markets? The Bitcoin value have been increasing since Febuary 2015. 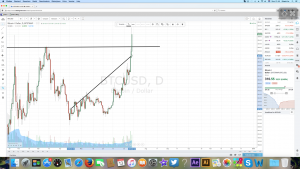 As you can see in the graph below the bitcoin is setting a new higher as it has broken his horizontal resistance level of 11 March 2015. Currently Bitcoin value was 310 dollars when writing this article. As you may have notice the bitcoin value began to rise in June. There are several reasons of why the bitcoin started to grow in value. It’s around that time when many US states were officially legalizing the bitcoin. Turmoil in Greece and China caused currency investor to invest in something that can increase in value like gold or bitcoins. The possible Grexit situation could make big and small companies realize that it might be better to have bitcoin as a spare currency in countries that have financial problems. So that when a bank doesn’t supply money, the companies can still do business. 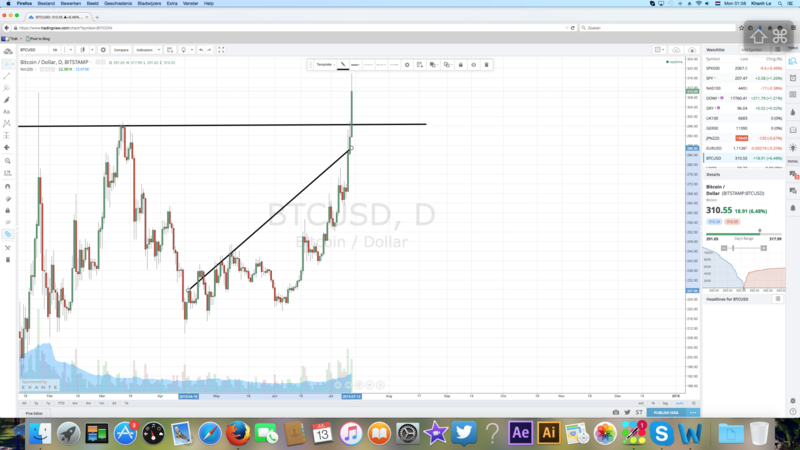 In short term Bitcoin value will go up, as long there is an uncertainty of Greece. For long-term is starts to look good for the bitcoin value. More and more US states is legalizing regulating on the bitcoin. And many bitcoin related start up companie are coming up all over the world. These companies where investors pour in millions of millions dollar will promote bitcoin heavily to the general consumers. It’s probably smart go for the short term first by trading in bitcoin cfds. Big percentage in price change will come since the bitcoin has broke its resistance level for this year. So your profits will be a lot bigger. And if you are in for the long term then buy bitcoins in portions. Don’t go all in right away. With the Greece Referendum all tension will be on today’s with the voting results. Will Greece say yes or no to the plans of the EU? On Friday some traders and investors are already selling their position or are buying new positions to benefit from the Greece current situation. Today in this blog we will discuss of what the possible consequences are when there is a Grexit. When a Grexit has taken place, the first thing that the Greece government is going to do is taking measures that would prevent a bank run before installing the their own currency Drachma. As you already might have notice, the Greece citizen can only withdraw 60 euro a day at the moment. Greece already has a bad economy and it will only get worse when there is a Grexit. Because there will be barely investment capital coming to Greece. It’s too risky for investors to invest in Greece. So Greece will struggle to get his economy growing. However Greece can devalue their currency to boost their export. But the question will be will the profit of the export enough to compensate the loss on the import and to grow the Greece economy? What are the possible consequences that we can expect on the EU? If we look at the export balance of Greece we will see that the top three export partners of Greece are: Germany (11%), Italy (10%) and Turkey (6%) of an average monthly export deal of 2200 million Euros a month. If Greece decided to leave the EU then Germany and other Greece top export partners could in theoretically buy more for a cheaper price. If we look at the import balance we see that the top three import partners are Germany (13%), Italy (13%) and China (8%) of an average monthly export deal of 3700 million Euros a month. With a Grexit we can expect that import value will drop, because it will be too expensive for Greece to buy. With import dropping in value not only companies get hurts badly in Greece but also companies that does business with Greece. Some are already facing problems already. One of the effects of the current capital control in Greece has caused is that Greece businesses aren’t allowed to pay its international suppliers. Companies that were doing business with Greece companies could go bankrupt or they might have to downsize. As being traders we could make good profitable trades by going short on these companies. Let’s take a look to who Greece owes money too. 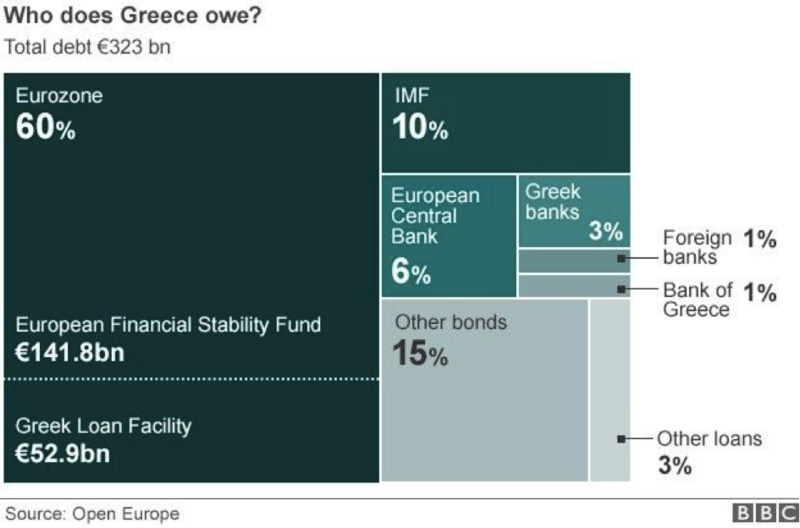 As you can see in the figure above where it states 15% of Greece debt is through bonds. Banks, institutional funds, private investors and so on were properly buying these bonds. When a Grexit has taken place, there is a possibility that Greece won’t pay any the interest to any of his debt holders for a while. They already have missed out the payment on the IMF. Banks and governments who were lending money to Greece will have to re-balance their budget because they don’t receive interest rate. This will lead into a tighter government spending and a tighter lending out money from the banks. Then one more thing that we should not forget is immigration. If Greece has no more money then how can they care of their borders? And we should not forget the threat that the minister of defence of Greece made in May. Where he threaten to over flood Europe with economic refugees and thousands of Jihadist. To put it simply blunt a Grexit will possible lead into a higher unemployment in Greece as well in Europe, companies can go bankrupt unless the governments bails them. All of this will probably bring Europe into a recession. When a Grexit has taken place the Euro will go down in value if there are no strong plans that show that Europe will survive the Greece crisis and that Europe will stay as a strong Union. What are the consequences on the markets? As we could see on last week Monday all markets were going down. And it recovers a bit during the week but that was because the markets were hoping that somehow a Grexit could be prevented. The bonds yields from different EU countries went up. Spain bond yield went up 11%. When the Grexit has taken place the markets will keep on going down until the EU and ECB can convince the markets to calm down with a realistic plan and program (QE2) that ensures investors that Europe will be a strong union. What is a trading mindset? As a trader I am not only constantly looking for opportunities to make a good profit but I also look ways to improve my trading skills. 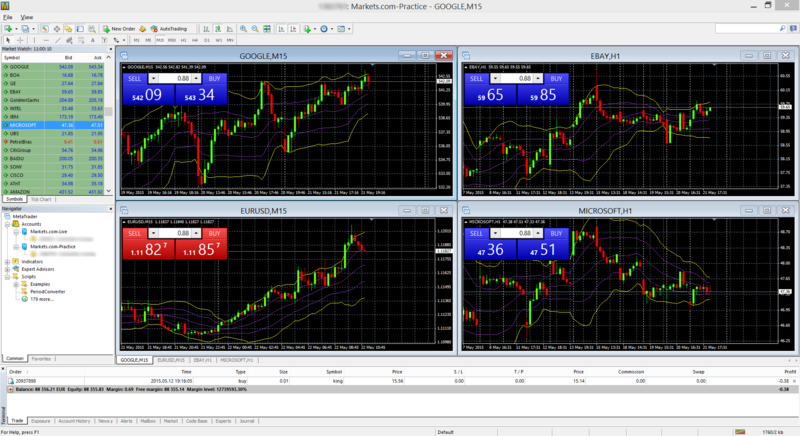 For me it is fun to see my profits increase after I have implemented something of what I have learned. Have you ever heard of trading mindset? If the answer is not then don’t worry. Because I have never have heard of it as well. Guess what? Today on youtube I have found something that is called “Trading Mindset.” Out of curiosity I went and check out that one hour youtube video. And I must say I have gain some valuable insights from it. So go and check out the youtube video. I hope you guy’s can gain some good valuable insights as well. I hope you have enjoyed the video about the trading mindset. A lot of psychological stuff was showed in here. And I have to say I have to agree with a lot of things that was showed here on the video. It’s important to have a gradings mindset. The video have showed with clear proof here is that all successful traders use a journal and they execute their trading plan. I myself have use trading journals for years. As it a rush for me to make the biggest return ever. So far my record for day trading is a return of 4000% in 6 hours. If you don’t know on how to create a trading plan or how to make a trading journal. Then go and register an account for this website for free . And read the guide line “How to trade like a pro in 5 steps “that I have created that based on my trading experience for free.